I've been obsessing over nail polish and intricate designs over the past 6 months. I haven't actually attempted any of the fabulous painting feats that I've been finding online, but I have been buying polishes here and there as I find magical colors that will someday make their way onto my nails (such as these Butter London polishes). The problem is that I now have too many little bottles of polish to comfortably fit in my designated drawer in the bathroom. Since I buy for the aesthetic appeal of the colors, I really want to display them in some way. 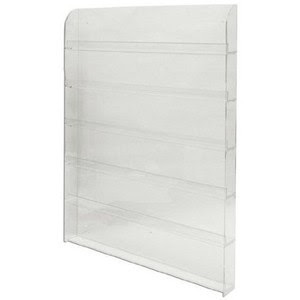 Here is the perfect solution to my problem: a nail polish display rack! The one featured above is Fuji brand, holds 96 bottles and is under $11 - super score! I can mount it in my bathroom, or if that's too "girly" for my boyfriend to handle I can always keep it near my desk. It's like bringing a nail salon home! I love butter london! And I can't believe that holds 96! I think I have hmm... 6 colors? haha!